Pilgrim's Progress was published on February 18, 1678, by the English Puritan writer John Bunyan (1628-1688). This book is a Christian allegory, divided into two parts. The first is about a pilgrim, called Christian, and his journey to the Celestial City. The second is about how the other members of his family followed after him on pilgrimage. Virtually every colonial home in New England had a copy of Pilgrim's Progress, and it was a best-seller worldwide. It has been since translated into over 200 languages and has never been out of print. Christian ran thus till he came at a place somewhat ascending, and upon that place stood a cross ... So I saw in my dream, that just as Christian came up with the cross, his burden loosed from off his shoulders, and fell from off his back. The narrator recounts the dream he has about a man called Christian. He has become desperate after reading from a book that the city where he lives will be destroyed. He is advised by a man named Evangelist to travel toward a light in the distance until he reaches a wicket-gate and continue from there to the Celestial City on top of Mount Zion. He convinces his neighbor Pliable to come with him but his other neighbor Obstinate refuses to follow him. He is unable to convince his wife (Christiana) or any of his four sons (Matthew, Samuel, Joseph, and James, in birth order) to accompany him. Soon Christian and Pliable encounter a deep slough called Despond. Pliable decides to return to the City of Destruction but Christian continues his journey. He is rescued from the Slough of Despond by a man named Help. Next he encounters Mr. Wordly Wiseman from the town of Carnal Policy. He advises Christian to go to seek Mr. Legality from the village of Morality on the top of Mount Sinai in order to be relieved of his burden. Christian is stopped by Evangelist who urges him to turn back from the path that avoids the cross and search the strait gate instead, which leads to salvation. Christian finally reaches the wicket-gate which is opened by a man named Good-will. He warns Christian that the castle near the gate is ruled by Beelzebub who attempts to shoot anyone who goes through the gate and Christian quickly goes through it. Good-will advises him to continue his journey until he reaches the place of deliverance and is relieved of his burden. Good-will guides him into the house of the Interpreter who shows him various allegorical visions with moral lessons. Then Christian encounters a wall named Salvation which he follows until he finds a cross and a sepulchre under it. At the sight of the cross he is relieved of his burden which falls into the sepulchre and meets three shining ones who remove his clothes, give him new ones, press a mark on his forehead and give him a roll with a seal on it which he must give at the Celestial Gate. He soon meets two men called Formalist and Hypocrisy who have gone around the wall rather than through the gate. They travel together until they reach the Hill Difficulty. While Christian climbs the hill, the two men follow two paths that go round it called Danger and Destruction and eventually meet their death. A fold-out map, from a 1778 edition, detailing Christian's journey. While climbing the hill Christian falls asleep and loses his roll but manages to find it after returning to search for it. He is warned about lions guarding a nearby palace named Beautiful by two men called Mistrust and Timorous but when encountering the lions the porter of the palace's lodge named Watchful tells him that the lions should not be feared as they are chained and are merely a trial of faith. The porter welcomes him to the palace which he reveals was built as a place of rest for pilgrims by the lord of the hill, the son of the Ancient of days. In the palace he meets four women called Discretion, Piety, Charity and Prudence. When morning has arrived the women accompany him down the hill and Christian arrives to the Valley of Humiliation. Christian soon meets a monster named Apollyon who claims to be his king and refuses to allow him passage. With the weapons and armor he had received from the four women, Christian is able to defeat Apollyon after a long battle and continues his journey. Soon he arrives to another valley named the Valley of the Shadow of Death. It is a completely dark desert with and a ditch on one side and on the other a quagmire, both of which he is in danger of falling in and he can hear frightening sounds around him. He finally reaches the end of the valley where he encounters a pile of bones. Formerly two giants named Pagan and Pope had killed many of the people passing through but Pagan had died long ago and Pope had become so stiff he could no longer do anything outside his cave. Then Christian meets Faithful who had left the City of Destruction soon after him and he tells Christian about his journey. First he met a woman named Wanton who attempted to tempt him but was able to escape him. Next he met a man named Adam the First from the town of Deceit who wanted him to marry his three daughters but soon escaped him as well. He next met Moses on the Hill Difficulty who wanted to punish him for his former sins without mercy but was saved by man with holes in his hands, whom he recognized as his Lord. In the Valley of Humiliation he met a man called Discontent and another called Shame who attempted to make him abandon his journey but he disregarded them. Soon they are met by a man named Talkative. Faithful is impressed by his manner of speech but Christian warns him that Talkative only talks of religion and has none in his heart. Faithful challenges him on this and Talkative leaves angrily. They are met again by Evangelist who warns them about a nearby town where they may suffer for their faith but assures them that if they face death they will be rewarded. Christian and Faithful soon arrive at a town called Vanity. In the middle of the town is a fair called Vanity Fair because all sorts of vanity are sold there. The two are soon arrested by the people for their strange clothing and speech and their refusal to buy anything and are shut in an iron cage. Faithful is taken to trial for causing a disturbance before the judge named Lord Hategood. Three witnesses named Envy, Superstition and Pickthank testify against him and the jury finds him to be guilty. He is burned at the stake but after his death he is driven in a nearby chariot to the Celestial City. Meanwhile, Christian escapes from Vanity and is accompanied by one of its inhabitants named Hopeful. They arrive at a river called the 'river of God' and the 'river of the water of life' with many fruit trees on its banks and meadows on either side. The way following the river is rough so Christian decides to in stead follow a meadow called By-Path on one side of the path. They are met by a man named Vain-confidence going to the Celestial City. Soon it becomes dark and Vain-confidence accidentally falls into a deep pit and dies. It begins to rain and the two decide to rest under a shelter. They fall asleep and in the morning are captured by Giant Despair, the lord of Doubting Castle and thrown into his dungeon. Advised by his wife Diffidence, Despair tries to convince the Pilgrims to commit suicide but they refuse. After many days Christian remembers he has a key called Promise with which he manages to unlock the dungeon door and the castle gate. Before continuing their journey, the two erect a pillar warning future pilgrims of Giant Despair. They reach the Delectable Mountains on Immanuel's Land and are met by four shepherds who guide them through the mountains. The two receive a note of the way and are warned to beware the flatterer and sleeping on the Enchanted Ground. Soon they meet a young man named Ignorance from the country of Conceit who also seeks the Celestial City but has not walked through the wicket-gate. They meet a black man wearing white clothes who convinces them to follow a road that is going farther away from the Celestial City. They fall into a net but are freed by a Shining One who reproaches them for not following the shepherds' directions but instead the flatterer they were warned about. They meet a man named Atheist who laughs at them for searching the Celestial City as there is no such a place. Hopeful answers that they have already seen the city from the Delectable Mountains and concludes that 'he is blinded by the god of this world'. The pilgrims manage to walk over the Enchanted Ground without falling asleep and arrive at the pleasant country of Beulah on the borders of Heaven where the sun shines at day and at night. They arrive at a gate to the Celestial City but before it is a river with no bridge. As they attempt to cross the river, Christian is about sink but Hopeful helps him to the other side where they are met by Shining Ones. After climbing the hill they reach the golden gate which is opened. They are given new clothing as well as a crown and a harp and are welcomed by the people of the city. Ignorance is helped across the river by a ferryman named Vain-hope in his boat. He knocks at the gate attempting to get in but the Shining Ones bind him and carry him to hell. Part Two features Christiana, who along with the four sons and Mercy (her maiden), begin the same journey to the Celestial City that Christian previously took. They stop at the same places as Christian with the addition of the inn of one Gaius, where they reside for a time (and where James marries Gaius' daughter Phoebe). The journey is longer than Christian's to account for four marriages (in addition to James, Matthew marries Mercy, while Samuel and Joseph marry Grace and Martha, daughters of a Mr. Mnason) and childbirths. Arriving at the gate to the Celestial City (along with several other pilgrims), Christiana is called over first. She gives her blessings (and warnings) to her children and fellow pilgrims, and then crosses the river to reunite with Christian. The other pilgrims are also called in time and do likewise. However, the narrator mentions that he did not stay long enough to witness the children and their families cross, they remained and brought great increase to the local church at that place. 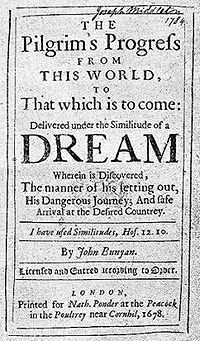 The radicals of John Bunyan's day felt that new revelations were imminent and Bunyan's attraction to this idea can be detected in Pilgrim's Progress, though he remained essentially a conservative. ↑ John Bunyan, The Pilgrim's Progress, The Christian Library edition, 1984. ↑ Dayton Haskin, "The Pilgrim's Progress In The Context Of Bunyan's Dialogue with the Radicals." Harvard Theological Review 1984 77(1): 73-94. This page was last modified on 21 January 2018, at 19:08. This page has been accessed 13,832 times.